This summer, the federal government proposed a series of reforms to the Income Tax Act designed to close certain tax loopholes and address tax avoidance. Finance Canada says these changes would impact Canadian-Controlled Private Corporations (CCPCs) in three key areas: income “sprinkling” (a type of income splitting), passive investments made by small businesses, and the conversion of small-business income into capital gains. The Liberals were elected federally in 2015 on a platform that included promises to address tax avoidance and, in particular, small-business income splitting. Nonetheless, the government’s summer announcement seemed to catch Canadians off guard, leaving many small businesses across the country incensed by the language and implications of the proposal, and many others confused by the complexities of the reform. Debate about the changes is currently playing out in the media, where critics and lobby groups are attempting to frame the issue as an attack on the middle class and small-business owners. As tensions rise, it has become increasingly difficult to separate fact from fiction, and determine who exactly is impacted. I recently released a report that looks at precisely this issue, focusing on who benefits from one of the three areas targeted for reform: income sprinkling. Given the arguments being made in the ongoing debate over these tax proposals, the results might come as a surprise. In fact, the top 20% of families by income level capture 91% of the tax benefit from income sprinkling, according to data from Statistics Canada tax modelling software. The top 5% of families, making more than $216,000 a year, get half the benefits. 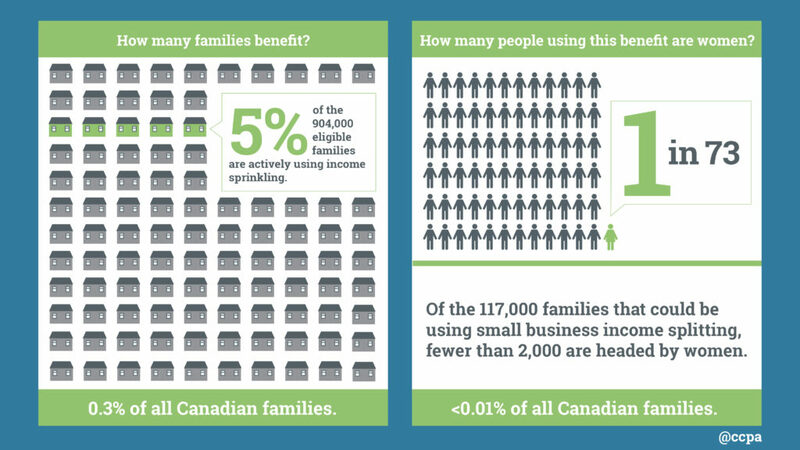 The bottom 70% of families, including all middle-income families, share just 3% of small-business income splitting benefits. Not collecting these taxes likely costs $280 million federally and $110 million provincially on an annual basis. 2. Male-headed families are much more likely to benefit from income sprinkling than female-headed ones. Of the 117,000 families that could be seeing a net benefit from small-business income splitting, only around 2,000 of them are headed by women. 3. A very small number of businesses are impacted. At least 87% of families declaring small-business income see no net benefit from income sprinkling. So, at most, 13% of these families could be benefiting. However, that assumes they all fail the new “reasonableness test” on dividends. My report estimates that just 5% of these families (or 0.3% of all Canadian families) would likely fail that test, and therefore be impacted by reforms to income sprinkling rules. Interestingly, the average tax benefit is lower than the vocal push-back to the proposed reforms suggest. Even for families in the top 1% (making more than $416,000 a year), the average benefit only rings in at $10,000. 4. Professionals are far more likely to be using this tax strategy than traditional small businesses. 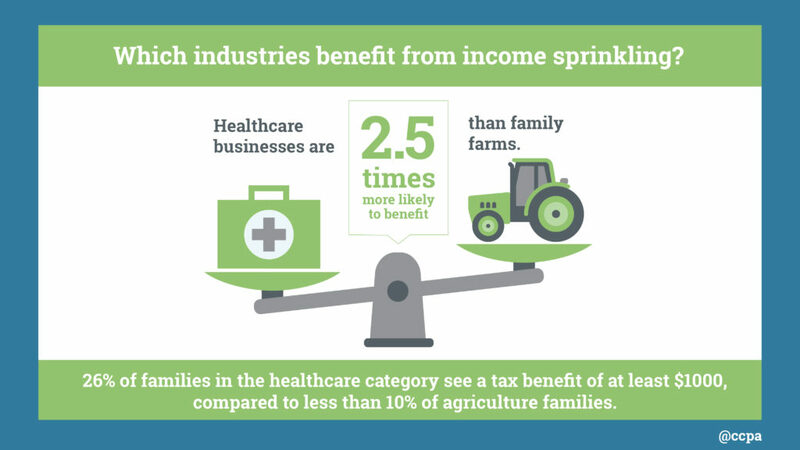 Families in the health care sector are two-and-a-half times more likely to benefit from income splitting than traditional small businesses like family farms and restaurants. Professionals like lawyers and accountants, as well as families in the real estate and insurance industry, are the second and third most likely to benefit, respectively. Even so, at most only around a quarter of families headed by an individual in the health care industry see a tax benefit of at least $1,000 from small-business income splitting. 5. Closing the income splitting loophole is an important first step to restoring fairness to Canada’s tax system, but it must be part of a more ambitious package of reforms. Canada’s income splitting rules don’t incentivize entrepreneurship, and don’t help the middle class or most small businesses. Given the benefits are concentrated among professionals and high income families, the CCPC income-sprinkling loophole should be closed. Finance Canada’s proposed reforms would have a positive, if modest, impact on reducing income inequality and should be part of a broader public examination of other costly and regressive federal tax expenditures. It’s been 51 years since the last comprehensive public review of tax expenditures, and since then our tax system has become overly complex and riddled with loopholes that worsen inequalities. Policymakers should tackle the bigger fish, including eliminating the stock option deduction and taxing income from capital gains at the same rate as employment income. Together, these measures will help ensure the fairness, reduce inequalities, promote economic growth and help fund vital public services, such as affordable child care or secure retirement solutions for all Canadians. In short, it’s time Canada’s tax system worked for more than just a rich few. David Macdonald is a senior economist with the Canadian Centre for Policy Alternatives. Follow him on Twitter @DavicMacCdn. His report, Splitting the Difference: Who really benefits from small business income splitting?, can be downloaded online at www.policyalternatives.ca. On September 28, 2017, David will present findings from his report at the House of Commons Standing Committee on Finance (FINA)’s Tax Planning Using Private Corporations: Contributions to the Department of Finance’s Consultations. • Will income-splitting’s politics trump its lousy economics? The tax system will never be fair until we are all paying the same rate on our income and free of the obfuscating reams of qualifications, the ticket to paying anything but a fair share.